The Anaheim Packing House is probably one of my new favorite places to go in Southern California. It reminded me of Chelsea Market in Manhattan, expect that it felt more crowded and it focused more on hip and trendy foods. (To give you an example, there was a dessert called Dragon Breath, which is milk condensed into little balls via liquid nitrogen, creating that cool dry ice effect). We met my college roommate and her boyfriend at Ecco, which is an Italian restaurant located at the end of the packing house, allowing for an outdoor patio. I got an Ace pineapple cider and a prosciutto and arugula pizza. And this wasn’t just any pizza… this pizza tasted close to a true authentic Italian pizza. A pizza whose crust is perfectly charred, whose sauce to cheese to crust ratio was carefully created, and whose toppings were minimal yet perfectly balanced, all and all creating a delicious pie! It brought me back to my days touring around Italy with my family, and me eating a full Italian pizza, by myself, every day. No regrets. Seeing so many family and friends felt like the best kind of celebration. And you know what goes great with celebrations?? FUNFETTI SUGAR COOKIES. Celebrating time with loved ones, or celebrating awesome coworkers, or simply celebrating the fact that you made dinner AND did the dishes. Go you! What I love about these cookies are how simple and easy they are to make. 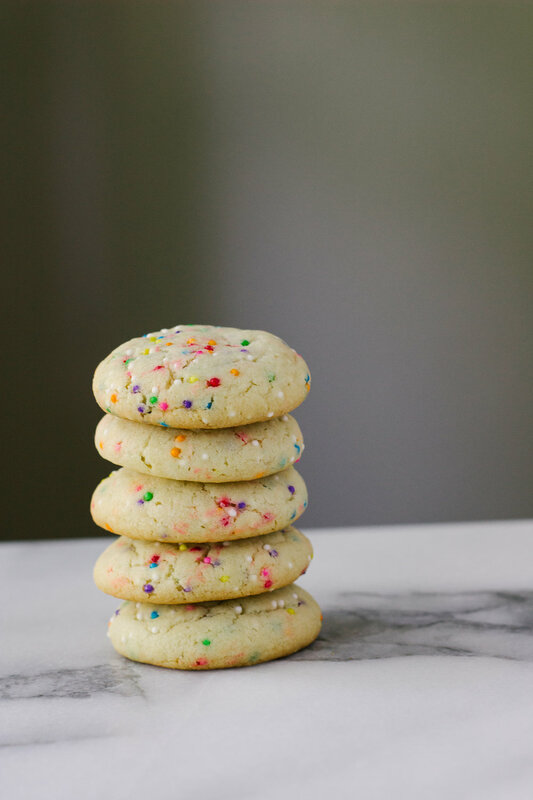 The hint of almond extract will have you thinking these cookies are a slice of the classic funfetti cake most of us grew up with. AND with only one mixing bowl needed, there is very little clean up needed. That in itself should deserve a funfetti cookie, right? 6. Roll 1 Tablespoon worth of dough and place 2 inches apart on a large baking sheet. 7. Bake for 12 minutes, until cookies are pale and puffy with slightly golden edges. Transfer cookies to a wire rack to cool.